This is the current SBAC schedule. Please remember the schedule is subject to change so check back often. 3rd grades will be taking SBAC the weeks of April 15th and April 29th. 4th grades will be taking SBAC the weeks of April 15th and April 29th. 5th grades will be taking SBAC the weeks of April 8th, April 22nd, and May 6th. 6th grades will be taking SBAC the weeks of April 8th and May 6th. 7th grades will be taking SBAC the weeks of April 8th and May 6th. 8th grades will be taking SBAC the weeks of April 8th, April 22nd, and May 6th. 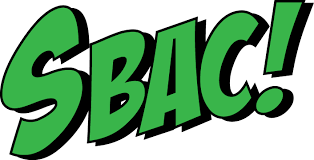 Ms. Alcala's 5th grade will be taking SBAC the weeks of April 8th, April 15th and April 29th and the 4th grade students will be taking SBAC with the other 4th grade classes. Ms. Zhou's class will be taking SBAC the weeks of April 15th and April 22nd. Ms. Corado's class will be taking SBAC the weeks of April 15th, April 22nd, and April 29th.